About 30 artificial lakes may be built in Canada’s oil sand rich province of Alberta by the time companies currently extracting heavy crude from the area finish their work, as they plan to flood abandoned mines with a mix of tailings and fresh water. Known as end pit lakes, the inundated old mines represent a cheaper alternative to other remediation techniques, such as those that use dirt instead of fluids. If the idea goes ahead as planned, northern Alberta would become the largest man-made lake district on Earth, but not necessarily the most attractive to tourists and locals. Oil sand companies involved in the project, such as Syncrude Canada, Royal Dutch Shell, and ExxonMobil affiliate Imperial Oil, say the lakes will be clean enough for fish and people. A document produced by Alberta’s industry-funded Cumulative Environmental Management Association, reveals details about the proposed lakes size and scale, but it also makes clear that there will be a vast and permanent environmental imprint caused by the industry in the area. The End Pit Lakes Guidance Document highlights as well the risks of building so many lakes, especially as some analyses can’t be done until one of the companies actually builds its first lake. 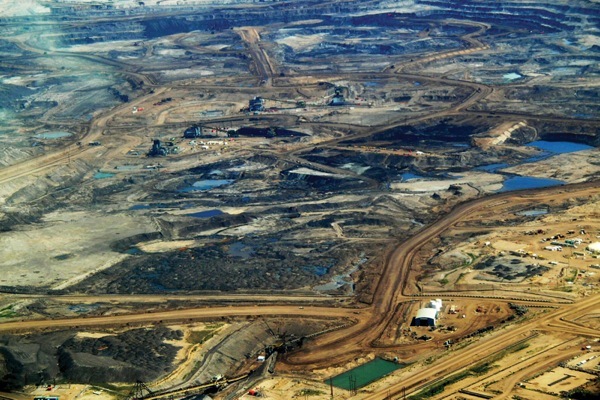 According to Bloomberg that might happen earlier than expected as oil sands companies are already “running out of room to store the contaminated water that is a by-product of the process used to turn bitumen–a highly viscous form of petroleum–into diesel and other fuels." Non-profit environmental group Pembina Institute has warned that there is no way to predict how the ecology of those pit lakes will evolve over time, and describes them as "high-risk and experimental." One of the major concerns surrounding end pit lakes is the possibility of contaminated water seeping into the ecosystem. Earlier this month, residents living near the Athabasca River were warned not to not to draw water from the watercourse or allow their livestock to drink from it, after a coal-mine waste-containment pond failed on Halloween night. The incident followed a series of pipeline breaks and train derailments that have resulted in toxic spills in the area. Image by howlmontreal, via Flickr.